Oppo has finally launched its flagship phone – Oppo Find X – at the lavish reveal event held at the Louvre in Paris. Fans and industry experts were anxiously waiting for the flagship, for which the biggest highlight is the motorized camera slider that pops out from the top. If you are thinking this is just another slider that won’t last long, Oppo says the slider has been tested for durability for over 300,000 times. Apart from the slider, another key feature that Oppo has come up with is the facial scanning technology called the O-Face Recognition, to compensate for the absence of the fingerprint recognition. The Chinese company claims that the 3D tech is powered by a 3D Structured Light Technology, which has never been used on an Android phone before. To read the face, the tech considers 15,000 facial dot recognition and intelligent analysis. Further, there is also an IR sensor that allows the O-Face to work in the dark as well. According to Oppo, the O-Face Recognition tech is twenty times safer than the fingerprint recognition. The Oppo Find X also brings animated 3D emojis – referred to as 3D Omoji – something similar to the iPhone X. The feature allows a user to create a cartoon or funny image to mimic their facial expression in real-time. Talking of the design, the Oppo Find X is fitted with a bezel-less display having a small chin, an attempt to compete with makers like Apple and Samsung. Further, it has the Galaxy S9-like curve around the side edges. It has a shiny metal back with curved edges. What’s interesting to note is that the handset does not have camera sensors on the front or the back as there is the motorized slider that opens and closes automatically with the camera app. 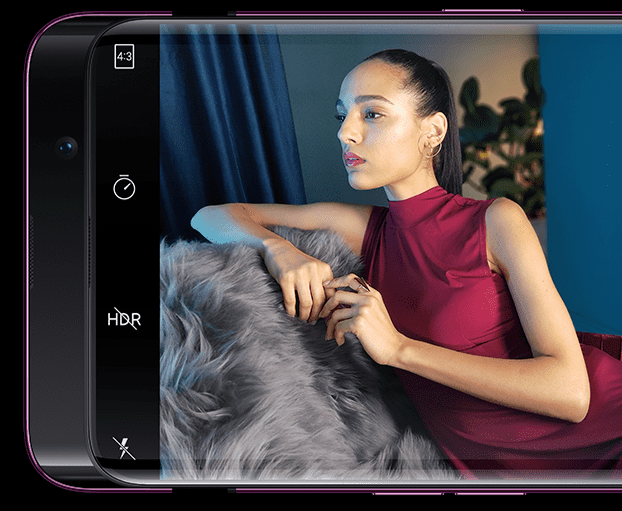 The slider includes a dual camera setup at the back and a single front camera. “With no holes visible on the screen and the unified design, OPPO Find X offers exceptional smooth handling and exudes pure beauty. Any time or place, the OPPO Find X will be the center of attention,” Oppo says. The Oppo Find X runs on ColorOS 5.1, which is based on the Android 8.1 Oreo. The handset sports a 6.42-inch (1080×2340 pixels) full-HD+ AMOLED display with 93.8% screen-to-body ratio, 19.5:9 aspect ratio and Corning Gorilla Glass 5 protection. The handset’s dimensions are 156.7×74.3×9.4mm, and weighs about 186 grams. The Oppo Find X is powered by Snapdragon 845 SoC with Adreno 630 GPU, and comes with 8GB of RAM. The handset has 256GB inbuilt storage, but there is no option to expand the storage via a microSD card. Further, it has a dual rear camera, including a 16 megapixels primary sensor with f/2.0 aperture and 20 megapixels secondary sensor with f/2.2 aperture. The camera also includes LED and OIS. The front camera is 25 megapixels with f/2.0 aperture. The Oppo Find X comes in two color options, Glacier Blue and Bordeaux Red, and supports dual-SIM slots (Nano+Nano). The Find X is equipped with a 3730mAh battery, and the connectivity options include Bluetooth 5 LE, GPS, Wi-Fi 802.11 ac, 4G VoLTE and USB-Type C port. Oppo Find X will be the first smartphone from the Chinese company to be sold in North America and Europe. The handset will be available from August this year. However, it is not clear if the August release is for North America or Europe, or for both. Previous Oppo phones were sold only in China, India, the Philippines and a few more Asian markets. At the Paris event, the Chinese company revealed that the handset will be priced at EUR 999 (about $1,155). The pricing details for India and China will be announced later. The company is scheduled to hold an event on July 12 in India and June 29 in China. Oppo is also releasing a Lamborghini edition of the Find X phone. The special edition phone is priced at €1,699 (about $1,961), carries an engraved logo and comes with better charging capability. The handset comes with Super VOOC charging, which according to the company, can fully charge the 3400 mAh battery in just 35 minutes. The Lamborghini edition also has a carbon fiber textured back with Lamborghini’s logo. Release date for the Lamborghini version is not yet announced. Previously, Huawei also came up with a special edition of its flagship – the Huawei P20 Pro. Huawei partnered with Porsche to release a Huawei P20 Pro Porsche Design Mate RS, which came with 512GB in-built memory.